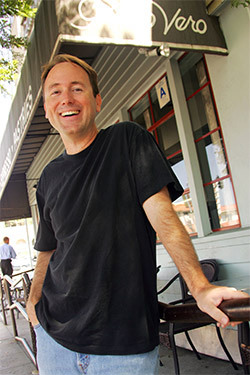 James Fowler, UC San Diego professor of political science and medical genetics. Photo by Kent Horner. You can’t catch a cold from a friend online. But can you catch a mood? It would seem so, according to new research from the University of California, San Diego. Published in PLOS ONE, the study analyzes over a billion anonymized status updates among more than 100 million users of Facebook in the United States. Positive posts beget positive posts, the study finds, and negative posts beget negative ones, with the positive posts being more influential, or more contagious. There is abundant scientific literature on how emotion can spread among people – through direct contact, in person – not only among friends but also among strangers or near-strangers. Little is known, though, about emotional contagion in online social networks. Yet, in our digitally connected world, Fowler said, it is important to learn what can be transmitted through social media, too. Fowler worked on the study with Lorenzo Coviello – a PhD student in the electrical and computer engineering department of the UC San Diego Jacobs School of Engineering. Additional coauthors of the paper are: Yunkyu Sohn, political science graduate student at UC San Diego; Adam D. I. Kramer and Cameron Marlow of Facebook; Coviello’s graduate advisor, Massimo Franceschetti, also of the Jacobs School; and Nicholas Christakis of the departments of sociology and medicine at Yale University. The researchers analyzed anonymous English-language status updates on Facebook in the top 100 most populous cities in the U.S. over 1,180 days, between January 2009 and March 2012. Researchers did not view any names of users or even the words posted by users. They relied on automated text analysis, through a software program called the Linguistic Inquiry Word Count, to measure the emotional content of each post. To find if there’s a causal relationship, the researchers needed to run an experiment. They found a natural one in rain. Rainy weather, it turns out, reliably changes the tenor of posts – increasing the number of negative posts by 1.16 percent and depressing the number of positive by 1.19 percent. 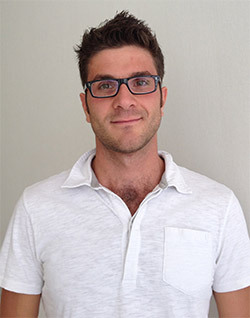 Lorenzo Coviello, graduate student in electrical and computer engineering in the UC San Diego Jacobs School of Engineering. Those are small changes but the researchers weren’t after big effects. They were looking for a random variable (as rain presumably is) that they could use as an instrument to measure the effect of a change in one user’s posts on the posts of their friends. To make sure that rain was not affecting the friends directly, they restricted their analysis to friends who were in different cities where it was not raining, and to make sure it was not topic contagion, they removed from their analysis all weather-related status updates. So, did the change in emotional expression by the people being rained on induce a change in their friends that stayed dry? Yes. According to the study, each additional negative post yields 1.29 more negative posts among one’s friends, while each additional positive post yields an additional 1.75 positive posts among friends. They also suggest that their findings are significant for public wellbeing. This research was partially supported by Army Research Office Grant W911NF-11-1-0363, and grants from the National Institute for General Medical Sciences (P-41 GM103504-03) and the Pioneer Portfolio of the Robert Wood Johnson Foundation.